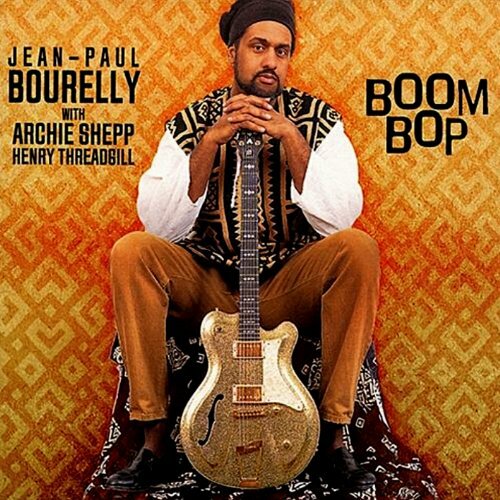 Jean-Paul Bourelly was born in Chicago Illinois on November 23, 1960. He took an early interest in music, starting piano lessons from the age of 4. At age 9, when his cousin Brain Jones, played him tracks from the Hendrix album Band of Gypsy’s, he realized that the electric guitar could lead a to vast new world of expression. He was thirteen when he finally started to take lessons and playing with friend, learning basic blues and rock songs. By the age of 16, he was performing in the local south side clubs, there meeting other musicians like Lonnie Plaxico, Steve Coleman and Darryle Jones and playing in local jam session, most notably session run by Chicago legend Von Freeman. NEW YORK Two years later in 1979 Bourelly followed the music to New York, with his goal set on, one day performing with the drummer Elvin Jones. He performed with Chico Hamilton, Roy Haynes, Olu Dara and composer pianist Muhal Richard Abrams upon his arrival, experiencing diverse sides of New York’s vibrant jazz scene. Finally in 1983 he got the call to join Elvin Jones’s Jazz Machine, touring with him for two years and having performed in several different lineups that included Richard Davis, McCoy Tyner and Pharaoh Sanders. Having completed his apprenticeship, Bourelly experienced more and more pressure to “tone down” his sound and so he gradually gravitated toward the punk funk or No Wave music scene that was going on in New York in the 80’s. He was starting to play in places like CBGB’S, the Lone Star cafe and the Pyramid Lounge while checking out more established groups like Sun Ra, James Blood Ulmer, Defunkt and James White and the Blacks. Some of the first signs of his own original blended sound, BluWave were noticed by the press a few years later while appearing with his first Ny band, the BluWave Bandits (a regular fixture at the original Knitting Factory). That was followed up by a debut album Jungle Cowboy (JMT 1987), then Enemy records release Trippin(1990) which provided Bourelly the possibility of touring in Europe and Japan. This concentration of activity, served to focus his search to playing a different type of funky music. After 5 solo recording with the DIW label Bourelly had the feeling that he desperately needed another musical atmosphere and context. By 1994, he moved to Europe. He started in his new location of Berlin by forming Boom Bop, an African /American crossover that arose in 1996 when Bourelly met the singer, drummer and griot Abdourahmane Diop in the section of the city known as Kreuzberg. He was deeply impressed by his art of recitation. The free treatment of tempo, blended our two different experiences (Afro American and Woloff) into some unique music,. With this international perspective, Bourelly was ask to curate Congo Square for the Diaspora project Black Atlantic in 2004. Through this project he would work with historian Paul Gilroy and their exchange helped to further his thinking about blended sounds of the Diaspora. Bourelly would lead a pivotal concert there that featured percussionist Dou Dou Ndiiaye Rose, Archie Shepp and bassist Sante Debriano, entitled, “Navigating the Jazz Impulse”. The next years Bourelly returned to the tried and tested guitar, bass and drum power trio format but this time equipped with a deeper cultural and sonic palette. From 2004 until 2006 he led several versions of the group Vibe Music that included John Blackwell(Prince), TM Stevens and another with bassist Melvin Gibbs drummer Felix Sabal Lecco; A solo acoustic project News from a darked out room; The seven piece group Cut Motion that is apart of the inter-local movement in Zurich; and in 2007 formed the Hendrix tribute band Gypsy’s Reloaded with Cindy Blackman/ and Melvin Gibbs. Bourelly latest group is 3kings. The trio consists of drummer Marlon Browden and Ghanaian bassist Jonas “bibi” Hammond. The formation of this group marks the first time that Bourelly has had a lineup formed in Berlin. The sound is a blend of familiar and desperate elements melted into a sound that is at once trashy, mystical and modern. The group’s distinctive sound was the impetus behind starting the jpgotmangos label and studio, where the band holds performance recordings, and releases them sporadically on the internet. All About Jazz musician pages are maintained by musicians, publicists and trusted members like you. Interested? Tell us why you would like to improve the Jean-Paul Bourelly musician page.